Having afternoon tea at a Chinese restaurant might seem like a strange concept, but when that restaurant is Yauatcha, a one-star Michelin Restaurant, it seemed like something worth trying. Yauatcha’s creator is the famous restaurateur, Alan Yau who propelled Hakkasan to international fame. Alan sold his majority shareholding in both these restaurants in 2007, although he still maintains a management interest. Alan Yau aside, part of my desire to try the afternoon tea at Yauatcha was also due to the spectacular and mouth-watering pâtisserie display in the restaurant front. If you have ever walked past it, you might know what I mean. Preparing for a spot of afternoon tea at Yauatcha, or any other decadent high tea location, requires a strategy similar to the kind that you might adopt for a major sporting event. Truth be told, I’ve never participated in a major sporting event, nor even a little one, so this is pure speculation on my part. But I imagine that you have to be disciplined in terms of what you eat, otherwise you might not last the distance or perform to your optimum. In this instance, a lack of preparation could have jeopardised my ability to gorge on all the delectable sandwiches and scrumptious cakes, and that was simply not on. The result was that when 2pm came, I was ready to eat. I even turned up early for our reservation. But unfortunately, things did not go to plan. While I had imagined diving into the food immediately, we were in fact not seated for another 15 minutes. My belly was not happy. And when we were finally seated, utter confusion reigned. Three different waiters came to take our orders, one after another; and this was despite the fact that, on the basis of advice given to us by the restaurant, we had ordered in advance ‘so as to prevent any delays’. So we ordered again, and again, and again, and then sent the staff away. But then, it seemed that they wouldn’t come back. We must have been too efficient at shooing them away, for thereafter, no amount of gesturing to them for service seemed to work, as they performed this fine dance of skirting our table. And so now it was me who was confused. If we were at afternoon tea, then where was the tea? It would be 25 minutes from the time we were seated before we were served any drinks, by which time I was not only very hungry, but also very parched. There are three afternoon tea sets to choose from: the ‘Yauatcha’ with sandwiches (£24.50); the Pink Champagne which is the ‘Yauatcha’ with a glass of Mailly Grand Cru Rosé (£31.50); and the Oriental which comes with dim sum (£24.50). All the tea sets are served with warm scones, petits gateaux, sweet sandwiches, pastries, exotic fruits and a pot of tea. 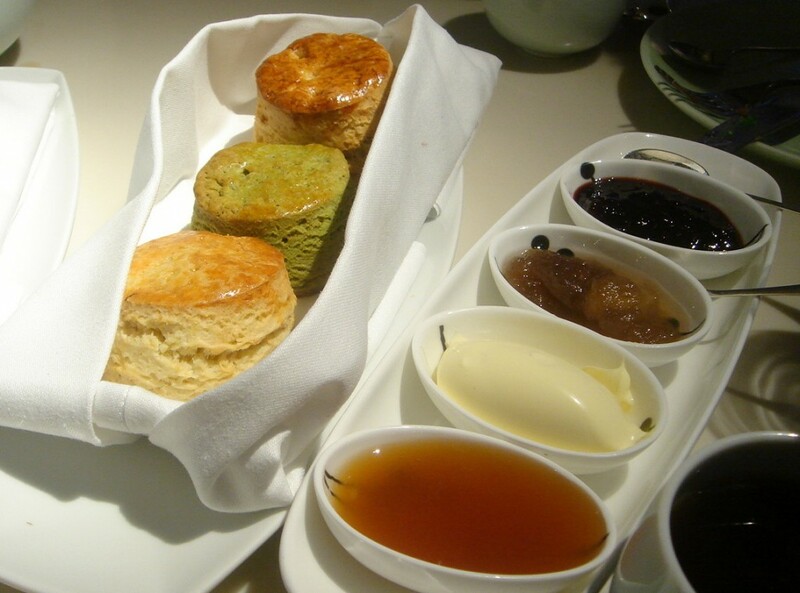 And if the tea sets don’t appeal, you can also order `a la carte, where a plate of scones costs £5.50. We ordered two Yauatchas and one Oriental, and three sets proved to be more than enough for the five of us, or rather, all that a tiny table better suited to three people could in fact hold. The savoury bites are kept to a minimum: four small sandwiches with various fillings. As for the dim sum set, it comes with only a baked venison puff, a char sui bun and a sesame prawn toast. All were very tasty but not amazing. But despite the minimalist approach to the savouries, the chaotic service, and the squashed table arrangements, the pâtisserie went a long way in making up for these little heartaches. They were as every bit as delicious as they looked in the window. We were tantalised with a perfectly presented selection of chocolate, raspberry, vanilla cakes; chocolate muffins; pandan macaroons and chocolate ganache pastries; to name but a few. Each individual piece was resplendent and uniquely exquisite. The exotic fruit consisted of nicely ripened and sweet mango, kiwi and various berries. Next were the scones: a selection of plain, raison, green tea and coconut, accompanied by a choice of honey, raspberry and apple jams, orange marmalade and clotted cream. The plain one scored the highest points, although I liked them all for their sheer uniqueness and variety. However, the scones had not been sufficiently baked, and were therefore a little soggy in the middle. After the scones, there were still more gorgeous sweet treats to come: chocolates, biscuits, and marshmallows with flavours such as coca-cola and passion fruit. But despite all my efforts at preparing for this occasion, my taste buds by this point had been defeated. Even for me, the volume of sweet things proved too much. We had ordered three sets between five, but on reflection, two would have been enough. We would have also all preferred a higher proportion of savoury bites, and for this purpose, I would recommend that for three people you order only one set and perhaps top up with extra dim sum. But as delectable as the cakes were, it was really hard to overlook the poor and badly managed service. The staff were not particularly rude, but they weren’t particularly friendly either. In keeping with the stylish, chic, blue décor; some looked like they had been hired for their aptitude for making it onto a ‘beautiful people’ list. But it might also be for their ability to sport a blank look and feign disinterest. Furthermore, persistent questioning of the staff revealed that they were ignorant on most matters relating to the food. Our queries were rewarded with little else other than a repetitive ‘I don’t know’. Another sore point is that Yauatcha do not offer free tea refills. Each tea set comes with only one pot, to be chosen from a limited selection off the tea list, and each additional pot incurs a charge, a practice I don’t agree with in a ‘Chinese’ restaurant. Most teas range in price from £3 to £11, although the 35 year old Puer tea from Yunnan, China, costs £46.20. We tried the Dargon’s Well Green Tea, the Puer Ya Jian (a dark tea), and the Classic Beauty (a blue tea). The latter was the resounding favourite thanks to its beautifully intoxicating aroma, and gentle nutty flavour. 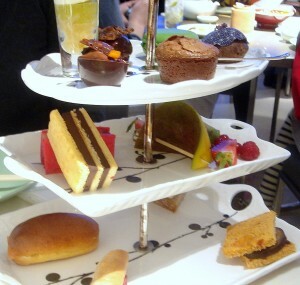 There is no doubt that the pâtisserie at Yauatcha is fabulous, and the variety and quantity of sweets offered for afternoon tea is also very good. So if you fancy trying it, do so, but with a little caution. Be prepared to: ignore the service, bring your own water in case you dehydrate while you wait, and order carefully so as to manage your savoury and sweet intake. Another tip is to perhaps go later in the afternoon on weekends, when the restaurant becomes less busy. During our visit on Sunday, all tables were filled when we arrived for our 2pm booking, although some of them started to free up by 4.30pm. So with a later afternoon time slot, you might stand a chance of getting better service. But then again, maybe not. Price – An afternoon tea set is £24.50. Excludes drinks and service. So many yummy treats with the tea! I would love to have some of those! I remember going there for the macarons and wasn’t disappointed! 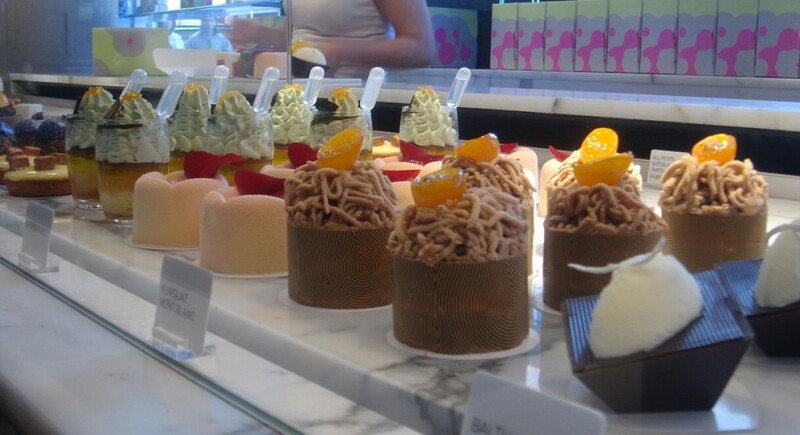 Although I admit I wasn’t there for La Duree-style perfection, I still loved the funky flavours. And the vibrant colours! I’ve eaten at Yauatcha now three times for the delicious hot&sour soup and dim sum, and not been overly thrilled with any of the desserts, although that lime passion iced tea you had in the picture is definitely one of my favorites ! I would have not thoughtb to go here for afternoon tea – but the cakes DO look sumptuous in the window, so I can understand the curiosity. This looks totally decadent! (And that’s a good thing.) I like tea quite a bit, though I’ve never formally had high tea before. Like you, only less so since I wasn’t paying for any of this, I thought that having to pay for more tea seemed a little ungenerous, especially considering the standing of Yauatcha. And unfortunate, too, since you arrived there hungry and parched. In any case, I really enjoyed this thorough, informative review. It’s too bad we don’t have anything like this in Hawaii. Everytime I pass by the window I say I must go sometime. I’ve been doing that for several years now. Maybe some day. The display would almost be worth the wait and the subpar service. Almost, but no quite. Your are a very generous soul – I am notorious for turning into a crazy b**ch when I’m hungry and kept waiting. The photo looks great and the desserts too. Nastasha, Don’t worry. Just email me when you get the chance. Canelvr,yes the macaroons were delicious! I will happily buy from there to go. Loving Annie, shame you haven’t enjoyed the desserts. I agree they do look delicious! 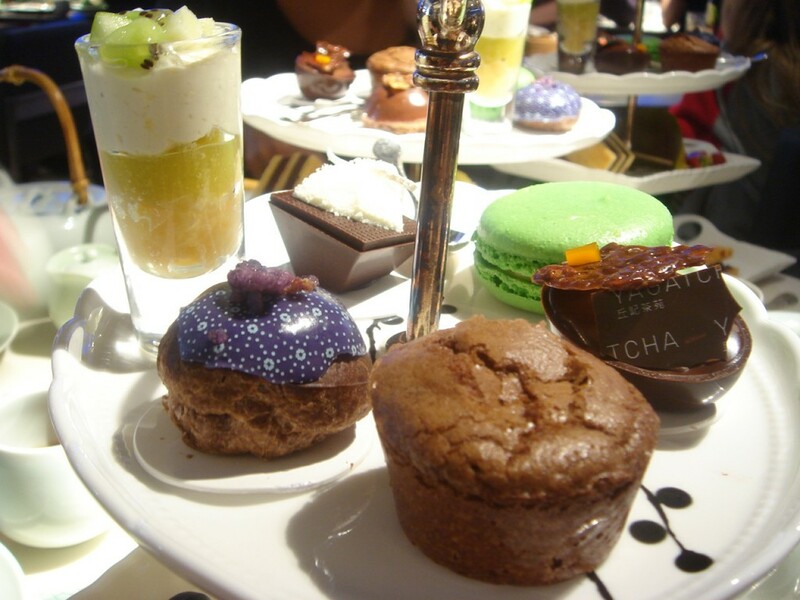 Sapuche, If you ever come to London, you must try high tea! It’s an English institution. Neil, I know, I kept going past it for years before I finally managed to make it to tea. Tangled Noodle, Yes when you get bad service it can really frustrating. Portuguese flavours, thanks! How are the recipes going? And to all of you, thank you for your comments! It does look amazing although I have heard before about bad service at Yauatcha so I don’t think you are alone there! Gosh. What a spread. I could cope with the worst service in the world if it meant experiencing this. It’s on the list for a special ocassion. Not sure why people keep raving about the bad service this and that, i go there quite often and i never faced any problems in terms of service its always great may be the time you went. Specially people recognize you after your first time and tell me how often does that happen in london? 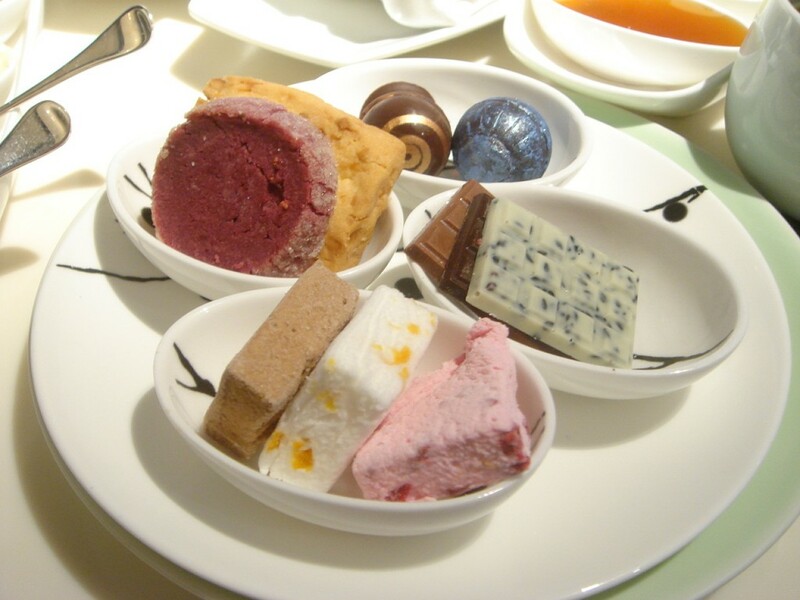 Hi Chinawhite, I thought the desserts were excellent at Yauatcha. What I wrote here about the service is an accurate reflection of my experience on the day, nothing more, nothing less. But I agree, trying to go when its less busy would probably mean you will get better service. I highy reccommend it! Thanks ‘Girl has to eat’, you defintely saved us from spending extra money and ordering to much food! Glad you enjoyed Yauatcha and thanks for visiting my blog. I just went for afternoon tea at Yauatcha this week and was defeated when they brought out the scones, even though the desserts were delicious. The service was ok, nothing outstanding, and they wouldn’t box up any of the items to take away – at The Berkeley hotel, they pack everything into cute little bags. Thanks for your review and excellent pics! Hey Cherie City, I am glad I could be of help!